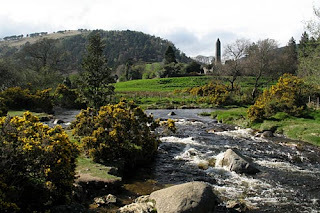 Glendalough is spectacular tourist attractions in Ireland. Glendalough is the Valley of the Two Lakes in County Wicklow. This is the site of the monastic settlement which has proved such an attraction for pilgrims and vocations to religious life. Glendalough located at South of Dublin in a remote valley in the Wicklow Mountains. Glendalough is a breath taking glacially sculpted green valley with steep mountains coming down to two tranquil lakes. As a true Oasis in the heart of the Wicklow Mountains National Park, Glendalough is one of the most visited locations in Ireland. The Gateway is one of the most important monuments and also now one of the most unique in Glendalough, Ireland. It was originally two stories with protecting walls at each end, or antae. There is a stone that has a cross inscribed in it in the gateway. This tower is 30 meters high and 3.5 meters in the base. One of Ireland’s most unusual and largest high crosses can be seen at Glendalough. The huge cross is carved from one single piece of granite. The cross is unusual in that it is not pierced through the ring like most Irish High Crosses. (In other words there is no opening through the ring of stone intersecting the haft and arms of the cross. This is certainly the only high cross I have seen in Ireland that is unpierced like this. The arms of the cross are over a metre in length. 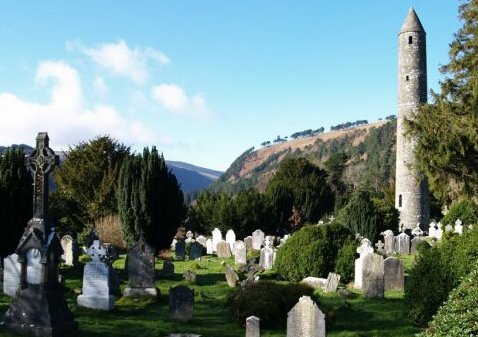 A local legend surrounding the St. Kevin’s Cross at Glendalough says that anyone who can wrap their arms around the entire width of the cross body will have their wishes granted. The most visible monument at Glendalough is the fine round tower. The famous Round Tower is about 34 metres high and is 16 metres in circumference at the base. It is still in near perfect condition even though it is almost 1,000 years old! The tower originally had six wooden floors and was connected by ladders. The four stories above the entrance are beautifully lit by a tiny window, while the top story has four windows. The tapering roof was redone in 1876 using the stones that were originally used. Just to the west of the church is a small raised platform with a stone walled enclosure. This enclosure held a small enclave of monastic stone huts. Close to this is St. Kevin’s Bed. This cave set in the rock face about 8 metres above the lake is said to have been a place of solitude and prayer for St. Kevin and later St. Laurence O’Toole who used the cave a as a retreat. The cave is partly natural and partly man made and runs 2 metres back into the rock. The largest building at Glendalough is the cathedral, which took many differnt phases from the 10th through the early 13th century. In the late 12th and early 13th centuries the chancel, sacristy, and north door were built and added on to this. Nearby is the Priests’ House, which has been almost completely rebuilt from the stones that were used first based on a 1779 drawing of the original. At each end of this tiny building there is an arch. This cathedral may have housed relics of St. Kevins, but the original use is not known. Priests were buried here and that is where this building gets its name form. This is the most recently built church. This church was built around the same time as St. Laurence O'Toole during the 12th century. Inside the church is decorated with a lion, a serpant and two birds. The birds are holding a head inbewtween their beaks. There is also a staircase that leads from one room to the building connected to the church. Glendalough is famous for spectacular settings include: lakes, hills, a very old monastic site. Glendalough always very busy on a Sunday when the weather is good, people come for a walk to enjoy the nature. You can go around the lakes and into Laragh on good paths. Or if you love climbing, you can climb the hills which also have tracks but can be a challenge at times.